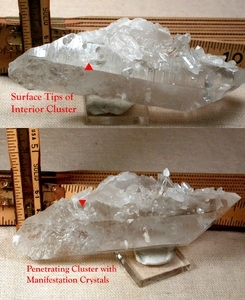 1 1/4x 1 3/4x 5" tall Arkansas doubly-terminated crystal with a 1/2x 3/4" manifestation and penetration cluster, a 1 1/2" penetrator, ADDITIONAL, multiple manifests, and a very rare, stepped channel face. Foils, brilliant rainbows, devic to foggier veils where another cluster lines the back and side of the host crystal, yet much clarity. Interrupted/regrowth to the 'new', partially faced termination.